WASHINGTON, DC, May 3, 2011 (ENS) – BP Exploration Alaska, Inc. will pay $25 million in civil penalties and implement a system-wide pipeline integrity management program for spilling more than 5,000 barrels of crude oil from the company’s pipelines on the North Slope of Alaska in March 2006. The penalty is the largest per-barrel penalty to date for an oil spill, said the U.S. Environmental Protection Agency, the U.S. Department of Justice and the U.S. Department of Transportation’s Pipeline and Hazardous Materials Safety Administration, PHMSA, announcing the penalty today. It was the largest pipeline spill in Alaska’s history. The program will cost an estimated $60 million over three years and is in addition to the $200 million BP Alaska has already spent replacing the pipelines that leaked on the North Slope. The company replaced 16 miles of its oil transit pipelines with new lines that have increased capacity for inspection and maintenance. “Today’s settlement with BP Alaska imposes a tough penalty and requires the company to take action to prevent future pipeline oil spills on the Alaska North Slope,” said Cynthia Giles, assistant administrator for EPA’s Office of Enforcement and Compliance Assurance. “The Clean Water Act gives the U.S. authority to assess higher penalties when oil spills are the result of gross negligence, and this case sends a message that we intend to use that authority and to insist that BP Alaska and other companies act responsibly to prevent pipeline oil spills,” said Giles. 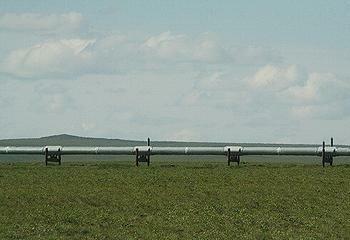 In March 2006, BP Alaska spilled some 5,054 barrels, or 213,242 gallons, of crude oil on the North Slope. A second spill, of 24 barrels, occurred in August 2006. Investigators from EPA and PHMSA determined that the spills were a result of BP Alaska’s failure to properly inspect and maintain the pipeline to prevent corrosion. PHMSA issued a Corrective Action Order to BP Alaska that addressed the pipeline’s risks and ordered pipeline repair or replacement. When BP Alaska did not fully comply with the terms of the order, PHMSA referred the case to the Department of Justice. Today’s settlement requires BP Alaska to develop a system-wide program to manage pipeline integrity for the company’s 1,600 miles of pipeline on the North Slope based on PHMSA’s integrity management program. The program will address corrosion and other threats to these oil pipelines and require regular inspections and adherence to a risk-based assessment system. Today’s settlement also addresses Clean Air Act violations arising out of BP Alaska’s improper asbestos removal along the pipeline in the aftermath of the spill. “This penalty should serve as a wake-up call to all pipeline operators that they will be held accountable for the safety of their operations and their compliance with the Clean Water Act, the Clean Air Act and the pipeline safety laws,” said Ignacia Moreno, assistant attorney general for the Environment and Natural Resources Division of the Department of Justice. “This penalty is a stern reminder to pipeline operators to follow orders issued by PHMSA or risk a federal civil lawsuit and steep fines,” said PHMSA Administrator Cynthia Quarterman. Of the $25 million penalty, about $20 million will be deposited in the Oil Spill Liability Trust Fund established under the Clean Water Act. These funds will be used to finance federal response activities and provide compensation for damages sustained from future discharges or threatened discharges of oil into water or adjoining shorelines. The remainder, $4.95 million, will be paid to the U.S. Treasury. In 2007, BP Alaska pled guilty to one misdemeanor violation of the Clean Water Act for the March 2006 spill and was sentenced to three years probation, ordered to pay a $20 million criminal penalty, including a $12 million fine, $4 million to the National Fish and Wildlife Foundation to support research and activities on the North Slope and $4 million in restitution to the state of Alaska. The consent decree is subject to a 30-day public comment period and final court approval by Judge John Sedwick in U.S. District Court for the District of Alaska.